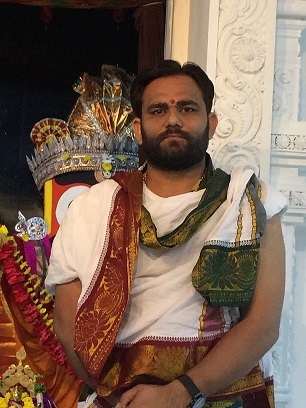 Pundit Jayesh Vyas joined HCCNA in March, 2018 as a priest. Pundit Jayesh Vyas is well versed in Vedic Shastras and Religious Scriptures and very proficient in doing various Hindu Rituals and Pooja for the community. He completed his education from Shree Amrut Veda Sanskrit Pathasala and Shree Bhagavat Vidyapit Shola in Ahmedabad and obtained Shukla Yajurved Visharad in 1992. He is a skilled Public Speaker and has conducted Bhagvat Saptah (7 days discourse of 6 hours each day). He speaks English, Hindi and Gujarati, and married with two daughters.